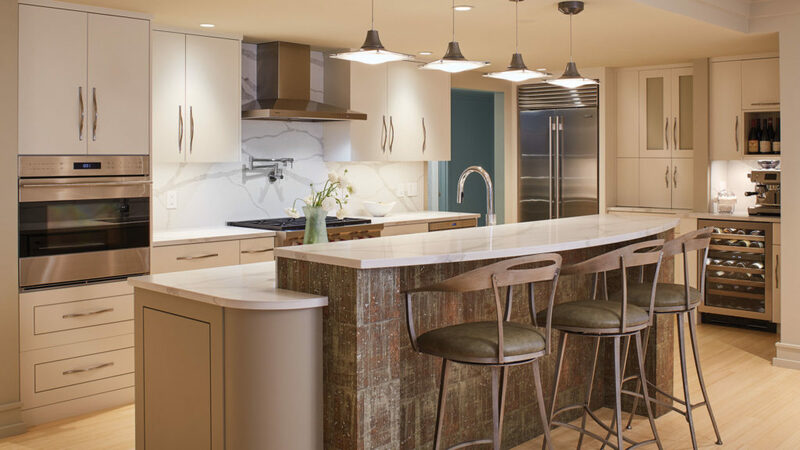 With the annual Kitchen Tour fast approaching (save the date: May 11, 2019), we took the opportunity to chat with Anne Young, a Music Hall member at the Advocate Level and the homeowner of one of the stunning kitchens featured on this year’s Tour. How long have you lived in Portsmouth? We have lived in Portsmouth for 1 year, 8 months. We moved here in June 2017 after selling our home in Exeter; although we did not move into this Market Wharf Condo until October 2017 after extensive renovation. You have a beautiful kitchen that is reminiscent of a Parisian cafe. What was your design inspiration? What is your favorite design aspect about your kitchen? I suppose my design inspiration is anything Parisian or French! I am an incurable Francophile and have always been naturally drawn to all things French. After attempting to teach myself French as a child from an old textbook and then working in the travel industry and traveling, I developed a healthy interest and appreciation for the culture, design, and people of France. I also love to cook and entertain for family and friends, so therefore the kitchen, and its design is so important to our family. I have an extensive collection of French cookbooks and was inspired by the look and feel of typical French bistros and cafés of Paris. Having said all that, my favorite aspect of the kitchen is both the design and functionality of the cabinetry. We were very lucky to be able to work with an amazing team that included CJ Architects, Revision Construction and Mari Woods Kitchen Bath and Home who together were able to bring our dream kitchen to reality. The cabinetry style is exactly the look we wanted, and the various functional details and features make it a practical, beautiful kitchen to cook and entertain in. As a downtown resident, you’re conveniently within walking distance of The Music Hall. What drew you to become a Member? When we initially moved to Portsmouth and rented at Portwalk Place while our condo was being renovated, we were gifted an initial membership at the Music Hall through that rental. We were so pleasantly surprised by the variety and quality of entertainment options, that we couldn’t believe we had never thought of joining previously. It was quite obvious that we would continue to renew our membership every year! Do you have any traditions around visiting The Music Hall? What has been your favorite show so far at the theater? Is there anyone coming up that you’re particularly looking forward to seeing? We have started the tradition of going to the Christmas musical. Last year we were blown away by the production of White Christmas, so we naturally went to Elf this year and were impressed yet again by the amazing performance. It is hard to say what has been our favorite so far this year, I am torn between Elf and the Boz Scaggs concert. What a pleasant surprise the concert was, bringing back many fond memories of high school and my college years at UNH! Going forward we are looking to seeing Whose Live Anyway?, Snarky Puppy, and Midtown Men. What are some of the “unexpected benefits” you’ve enjoyed from being a Music Hall member and what would you tell others who are considering joining? An unexpected benefit of being a member is being afforded the opportunity to purchase tickets to the Christmas musical early. This year we had fantastic seating for Elf, which I don’t think we would have gotten without the presale opportunity. The Music Hall has so much to offer residents of the area, with such a wide range of options to suit all interests. There really is something for everyone!